We give better care with the best technology that is available to best take care of your eyes. 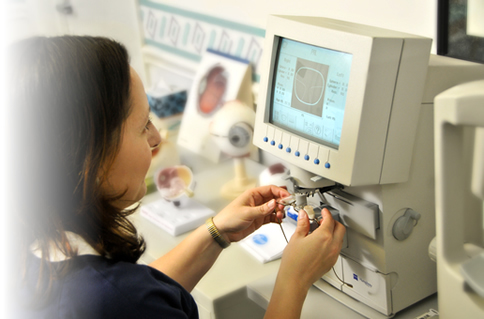 In today’s vision care world, providing the most thorough patient care requires state-of-the-art instrumentation. We provide our patients with excellent professional care and customer service by utilizing the latest instruments the ophthalmic industry has to offer. Eyemaginations 3-D is the latest in patient education. It delivers on-demand information to you via enhanced 3-D videos. Do you want to learn more about eye disease? How about contact lenses? Eyemaginations can quickly explain in detail what you want to know. The CR-DGi is a camera that enables the capture of well-defined retinal images which can help the us detect and monitor pathologies, including glaucoma and diabetes. It is equipped with a high megapixel sensor that captures retinal images of extreme high definition/resolution. This camera allows us to magnify very small retinal details, thus enabling us to detect and monitor pathologies, including glaucoma, diabetes and age related macular degeneration. The non-mydriatic retinal camera does not require that the patient’s pupil be dilated and makes it easier for patients to be able to drive their cars after having their eyes imaged. The CR-DGi needs only a small amount of light to capture clear images so our patients will not be discomforted by brightness. The GDx™ by Carl Zeiss Meditec is an instrument that offers easy testing and impressive diagnostic technology. GDx analysis has been proven to accurately discriminate between healthy and glaucomatous eyes and to be predictive of visual field loss. 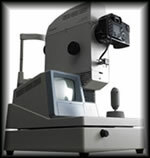 It provides unique early case detection, and is the only glaucoma imaging device with a separate Screening Mode to help identify which patients should receive a full glaucoma examination. It allows doctors to track change over time with the Advanced Serial Analysis feature, which helps evaluate subtle RNFL (Retinal Nerve Fiber Analysis) changes. In our office, the GDx screening test is part of our pre-testing for patients aged 40 and older. Once the patient is in the exam room, the results are explained to the patient. It is repeated yearly if the results are normal. If the results are abnormal, patients return for a full GDx evaluation. Our technology is one of the key factors that separates us from the competition.